Losing weight is one of the hardest thing to do for some people, but if you have the will and determination, easy weight loss is just so simple! Continue your healthy diet plans to achieve your goals in losing weight firmly and enjoy the rest of the days for living a healthy and fit body. 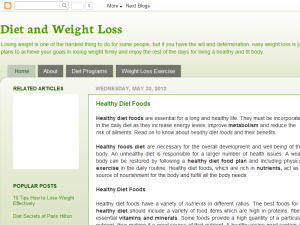 This what your Diet and Weight Loss Blog Ad will look like to visitors! Of course you will want to use keywords and ad targeting to get the most out of your ad campaign! So purchase an ad space today before there all gone! If you are the owner of Diet and Weight Loss, or someone who enjoys this blog why not upgrade it to a Featured Listing or Permanent Listing?